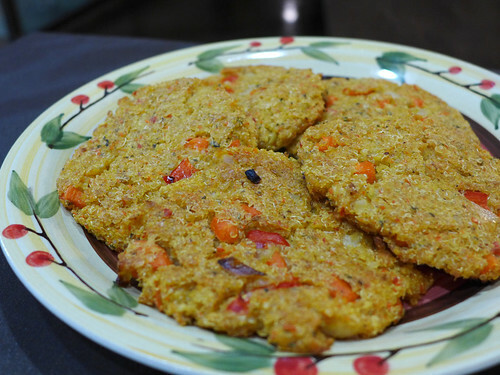 I’m a sucker for homemade veggie patties, and the Quinoa Vegetable Cakes from Vegan Holiday Cooking are among the tastiest I’ve ever had! Technically they’re a “cake,” not a burger, but they’re pretty much the perfect size for slapping between two slices of bread, so there you go. 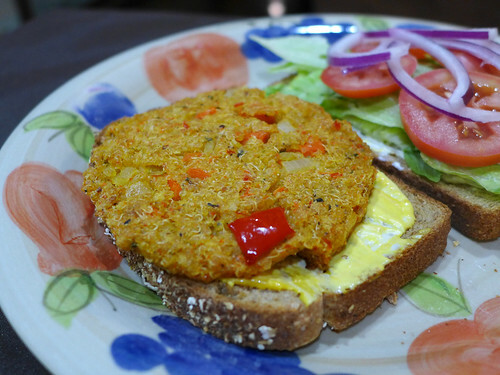 The batter is a mix of quinoa, onions, carrots, and red peppers, half of which you blend into a mash using a food processor (resulting in the burgers’ psychedelic neon orange color). Add breadcrumbs, shape into patties, and bake! The primary spice is cilantro, which made me a little nervous; I’m not the biggest fan (tastes like soap!). To my surprise, the cilantro isn’t at all overwhelming, and actually adds a rather nice flavor to the finished patties. You’re supposed to bake these bad girls at 350F for ten minutes, after which time they should be nice and crispy. Mine weren’t, even after twenty minutes in the oven, so I cranked the heat up to 400F to get the job done: about ten minutes on each side. 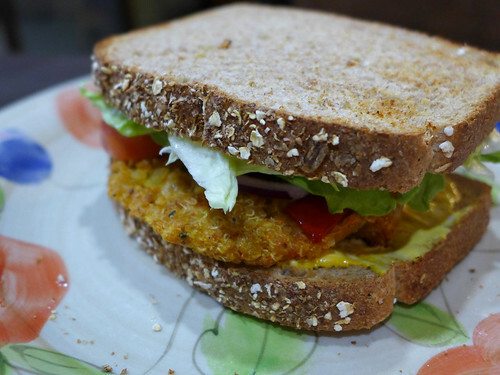 (The recipe also doesn’t say anything about flipping, but that’s the only way I could get both sides nice and crispy.) The next time I make these, I’ll go right to 400 degrees; ten to fifteen minutes on each side ought to do it. These are freaking amazing when served with lettuce, tomatoes, red onions, mustard, and Vegenaise (pictured above) – and even better when you swap out the fresh vettable topping from friend onions and mushrooms. YUM. This entry was posted on Tuesday, November 25th, 2014 at 2:08 pm. You can follow any responses to this entry through the RSS 2.0 feed. You can leave a response, or trackback from your own site.